Legionella bacteria are human pathogens commonly associated with water systems, such as HVAC condensers, stagnant reservoirs, hot tubs, and sumps. Testing for Legionella or for antimicrobial performance against Legionella requires a little insight into the needed product performance related to the actual environment that Legionella inhabit. 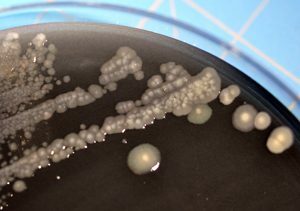 Unlike other antimicrobial product tests, such as tests for antimicrobial textiles or preservation tests for liquids and cosmetics, antimicrobial products for Legionella treatment will have a more stringent level of antimicrobial performance requirement due to the natural robustness of Legionella bacteria and the challenging environments that they commonly contaminate. Legionella bacterial growth derived from water reservoirs such as HVAC condensers and sumps. Legionella bacteria are commonly found in fresh water systems in both industrial and consumer environments. There are a range of antimicrobial products used for these environments (such as chlorination or cationic surfactants) that target the water component of these environments. The challenge related to the presence and potential for disease caused by Legionella, in addition to simply residing in water, is that they can also become established at high concentrations in water environments and then infect people in proximity to these environments as a result of aspiration of the contaminated water or water system. In recent history, this has occurred for HVAC condensing trays, industrial water treatment facilities, spas or hot tubs, and metal working fluid systems comprising a sump or high volume water storage. In these cases, the challenge was initiated by improper antimicrobial preservation of the Legionella contaminated system. These types of environmental conditions commonly provide a suitable environment for the establishment of Legionella and other microorganisms. Legionella in particular take advantage of other microorganisms, and once established, they pair as symbiotes with amoeba (1) resulting in a much more durable reservoir for the Legionella bacteria. Given the nature of exposure (via fresh water) and the possibility of a durable reservoir, products designed for use as antimicrobial performance for Legionella should account for several factors related to how these bacteria survive in relatively harsh environments. Antimicrobial product durability is the ability of the antimicrobial to survive the conditions expected for a given product use environment. For products intended to provide antimicrobial performance against Legionella, the durability needed can be significantly more stringent than with other microorganism types. For general antimicrobial product applications, incorporating antimicrobials into a finished product typically requires a short list of initial considerations for the needed product’s antimicrobial performance. Industrial systems such as large volume water systems, sumps, or water treatment facilities will need to directly manage the antimicrobial agents employed as part of a Quality Assurance program; this includes understanding the concentration of antimicrobial needed, seasonal variability for contamination, as well as environmental challenges and durability parameters specific to the treated system (such as those mentioned above). Smaller systems such as intermittent use items (condensers, trays, coils, and evaporators) have an additional level of concern. In these systems, the standard cycle is for the material to hold intermittent volumes of water that is cycled between wet and dry states depending on equipment use. These systems are most commonly associated with reservoirs of Legionella cohabiting symbiotically with amoeba, making them much more resistant to antimicrobial treatment. The required levels of antimicrobial in these products can be very different from other water systems. As a result, these products require testing that provides understanding of potential neutralizers of the antimicrobial in addition to the other durability parameters already mentioned. Antimicrobial performance testing for unique organisms such as Legionella may require adjusted strategies for incorporating the antimicrobial; assessing the use pattern and durability of the product will provide the best case analysis for understanding antimicrobial performance against Legionella bacteria. 1. Scand J Infect Dis. 1999;31(4):383-5. Free-living amoebae protecting Legionella in water: the tip of an iceberg? Winiecka-Krusnell J1, Linder E.